After a month of rough, feed your face kind of cooking, I came back and immediately wanted to make something light, and complex with fresh ingredients. Poached lobster seemed like the perfect dish. I’ve made butter poached lobster and it is heart stoppingly rich and decadent, but that’s not what I was craving. Instead I played with poaching the lobster in court bullion, white wine and a bit ginger, then finished with some fresh lime peel. Served with some basmati rice, it fit the bill perfectly. Next time I’ll highlight the citrus/ginger combination a bit more and cut back on the bullion, but poaching lobster is well worth the prep time involved. 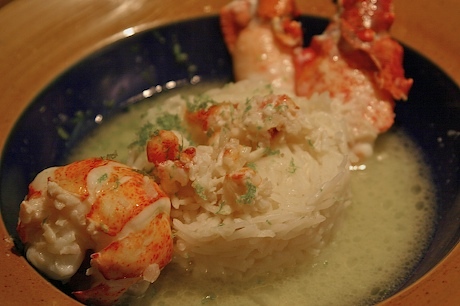 To poach a lobster: place the live lobsters in the freezer for about ½ hour to 45 minutes, depending on their size. When they are really sluggish, take them out, lay flat on their backs on the counter and using a large, sharp chef knife, cut the lobster firmly down the middle from the head to the tail. Do it quick. Do it clean. It’s kind of creepy because the fins and claws will still be moving but the animal is dead, and lobsters don’t have a central nervous system so you have in fact dispatched the critter with the least amount of suffering. Separate the tail, claws and body. Reserve the body (you can freeze it) for another use. Drop the tail and large claws into a pot of boiling salted water. Leave in the water for a maximum of 90 seconds. You want raw lobster meat, and it will not come out of the shell unless some hot water is applied. Very gently remove the lobster meat and keep chilled until you are ready to poach it. Poaching will only take a few minutes, as you don’t want to toughen the meat. You get the idea. Have some fun.